MDC supporters protestng in Harare (file photo). The government actions are priming citizens for what could turn into an explosive situation by denying people their rights while driving them into a corner, a local peace lobby group has warned. The Zimbabwe Peace Project, in a statement Thursday, said government's new monetary and fiscal regime has caused anxiety in the country. President Emmerson Mnangagwa has backed the tough reforms introduced by finance minister Prof Mthuli Ncube. "The anxiety created by the unpredictable economic interventions have pushed citizens on the edge setting the stage for potentially chaotic situation," the ZPP said. Zimbabwe spiralled into the vortex of an economic meltdown akin to the one that sent the local currency into oblivion 10 years ago after Treasury announced a new tax regime. ZPP drew parallels between the 2008 scenario and what has happened since last week. "The fears are not without basis after citizens lost all their savings in 2008 when similar policies were introduced," the organisation warned. "The ZPP has noted with concern rising tempers induced by the deteriorating socio-economic situation of citizens as manifested in the deteriorating economy as well as general hardships such as displacements and loss of livelihoods caused by removal of vendors from urban spaces in a clean-up meant to contain the cholera outbreak. "Citizens have the right to a livelihood and these raft of measures which have already hit hard the informal sector threaten the well-being of citizens." The ZPP said Thursday's crackdown on labour federation the Zimbabwe Congress of Trade Union (ZCTU) leaders was a precursor to fresh political instability. "Government has responded to these legitimate concerns by closing down all spaces for citizens to be heard by banning all protests thereby violating citizens' rights to freedom of expression and the right to petition government. 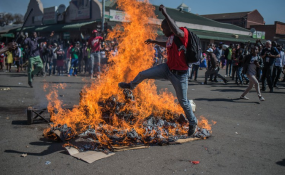 "The bottling up of anger through government's unjustified actions of banning demonstrations is a potential source of conflict and violent confrontations in the future if no economic solution is found," said the lobby group. ZCTU leaders were rounded up Thursday by authorities concerned about the labour union's a demonstration against fiscal measures announced by Treasury last week.